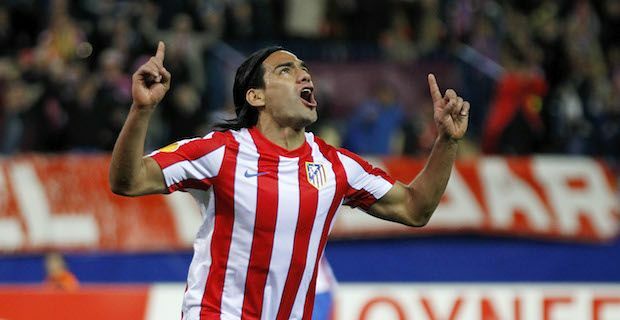 The 2014 summer transfer window will be one to remember for Manchester United fans after they landed Columbian striker Radamel Falcao on loan and Daley Blind form Ajax for £14m on deadline day. All in all, it was a bumper year for Premier League spending with a total £835m spent by the 20 Premier League clubs. Manchester United have incredibly spent just under £150 this summer and that figure is not even counting the reported £20m that Falcao's loan move will cost the club in wages alone although it does include a loan fee of around £6m. The Columbian is reported to be earning a staggering £350,000 per week at Old Trafford for the duration of his stay. Falcao and Blind follow British record £60m signing Angel Di Maria, Luke Shaw, Ander Herrera and Marcos Rojo into the club as part of a major rebuilding job. While United topped the spending charts, other clubs were hardly been restrained in their outlay with Liverpool paying out £117, Chelsea spending £93m and Arsenal blowing £82m. Southampton were the big winners when it came to selling though taking in an incredible £92m in one summer through the sale of players like Luke Shaw, Adam Lallana and Dejan Lovren. Besides the incredible capture of Falcao yesterday, Manchester United were also involved in the other big transfer of the day which saw Danny Welbeck join Arsenal for a reported fee of £16m. This will come as a huge relief to Gunners fans everywhere as Arsene Wenger desperately needed to add a quality striker to his squad to replace long term injury concern Olivier Giroud. Other clubs smashed their record transfer fees yesterday. Hull City signed Uruguay striker Abel Hernandez for £9.5m to replace Shane Long who they sold to Southampton earlier in the transfer window and Cystal Palace also broke their record for a signing when paying Wigan Athletic £7m for James McArthur. The record spending spree is all down to an increase in TV revenue for all clubs in England's top flight with each Premier League club now receiving at least £25m more per year in TV money. To put the spending in the English football into context, Spain's La Liga clubs spent almost half with a total of £425m while Italy’s Serie A and Germany's Bundesliga spent almost a quarter of English clubs with a total outlay of £260m and £260m respectively.